The Pirastro Gold Rosin is a soft treatment manufactured alongside Pirastro Obligato and synthetic core strings to maximise the potential of your violin or viola. This premium rosin enables you to have complete control of the bow, aiding the perfect sound. 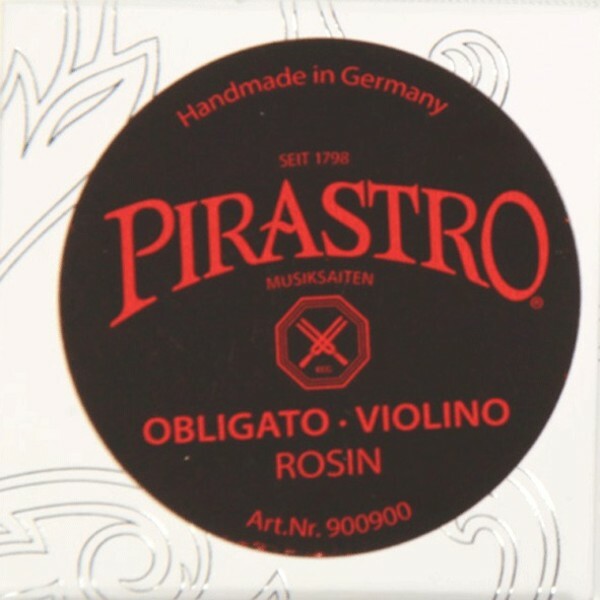 Pirastro tailor rosin to particular strings, and the Obligato has been specifically engineered to work alongside Pirastro's Obligato strings, as well as synthetic core strings. A high quality rosin allows for perfect bowing without scratchy sounds, especially if only a thin layer is applied. Violinists and violists tend to use a harder rosin, whereas cellists tend to use a medium or softer rosin. The Obligato series has a balanced thickness to provide a good match for gut core strings. The Pirastro Obligato rosin will complement your synthetic core strings to create a classic, effortless tone. An important aspect when choosing the right rosin is the core material of the strings that are being used. Dry rosin is more suited to steel strings, and synthetic gut strings suit a softer rosin. The harder the material of your string, the harder your rosin should be, however, it also comes down to personal preference and comfort on the instrument.